The 20-acre (8.1 hectare) derelict scrapyard was once overflowing with antique cars, including vintage Cadillacs, Chevy’s, Buick’s, Oldsmobiles, VW’s and numerous other makes & models, as well as a number of boats, custom vans, buses, freight trucks, bikes and camping trailers. The yard is separated into sections for each type of vehicle. There are many cars still remaining, but a number have been stolen over the years and the ones that remain have been stripped for parts by thieves. Furthermore, the owner, who is rumored to have numerous gambling and other debts, has crushed many of his valuable antique cars for scrap metal in order to pay what he owes. One day, some years back, when the owner hired a ‘scrapper’ to crush some cars on the property, local citizens were lined up along the road offering triple the value for the vehicles before they were to be crushed. The owner ignored them as he had made an arrangement with the scrapper that he couldn’t back out of. What remains after the pilfering and the crushing is a fraction of the original number of autos, thought the number is still significant. The property owner once owned a tow truck company. Many of the vehicles in this years being sold to him at very low prices from the customers who he served, and some of the cars sometimes being given to him for services rendered. He amassed an enormous collection of valuable antique vehicles over the years, which would now be worth millions of dollars. The collections is still valuable, but thieves regularly visit and the cars are slowly disappearing, piece by piece or body by body. Local law enforcement sometimes catches intruders, but prosecution is often halted as nobody has seen or heard from the owner in years and he cannot be located, even by authorities. It seems he may be laying low to avoid some serious debt collectors. I was shown around the property by a neighbor, a friendly though frustrated man who grew up with the junkyard owner and was once close friends with him. He gave me a roundup of the history of the property, the owner & automobiles, as well as describing regular incidents of thieves raiding the property. He hasn’t spoken to the junkyard owner, his childhood friend, in over 5 years, and has no idea how to get in touch with him. Watching the beautiful cars, as well as valuable antiques and other rare and expensive items be stolen or picked clean over the years has left him in frustration. Unfortunately, there is little he can do but watch. He tries to keep watch and notifies police regularly if he sees trespassers, but they often arrive too late to catch the intruders. The junkyard owner once took great pride in his collection, even having shot a thief in the past & pistol-whipping another to protect his automotive treasure trove. However, the owner has not lived on the property for some 20 years and rarely visits, having abandoned the location after a messy divorce that left him in a state of depression. His ex-wife’s custom Cadillac (sent to Italy & then re-imported after customization) sits parked in the driveway of the uninhabited house, in the same spot that it was parked and left behind two decades ago. He left derelict the posh house and many vehicles, became addicted to gambling in casinos over the border in Oklahoma and worked up a severe debt. The people to whom he owes money are likely heavy-hitters (loan shark-types), which may explain why he’s laying low and avoiding interactions with old friends, his collection and even the authorities. I visited the location a couple of times over a period of weeks, the last time being given a tour by the neighbor. We noticed that very recently, in between my previous visit and the current one, that someone had brought in a tractor and mowed away a trail of thick weeds to make a driving path. They used this driving path to pull a trailer up the hill on the side of the property and drive away with a valuable antique car. This is audacious, but they know that the risk is mitigated. 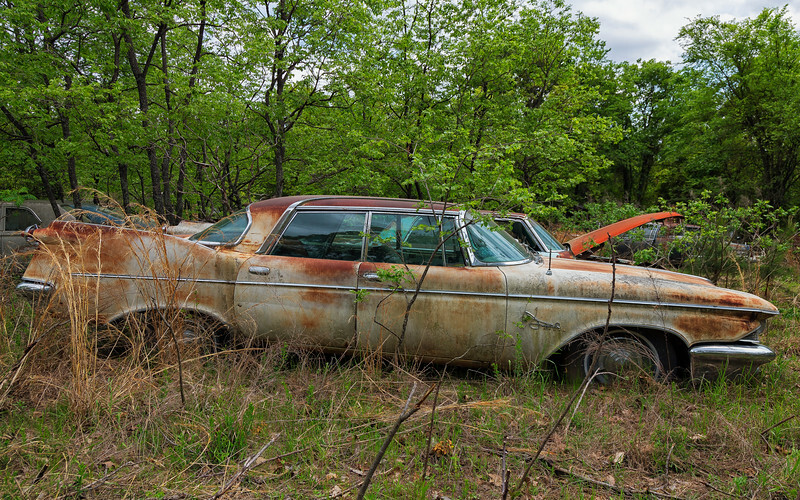 While exploring & documenting this fascinating location I was simultaneously awestruck by the amount of classic cars, many of them expensive and rare, and saddened by the loss of such a collection, the remnants of which sit and rot on a hillside in rural Arkansas.